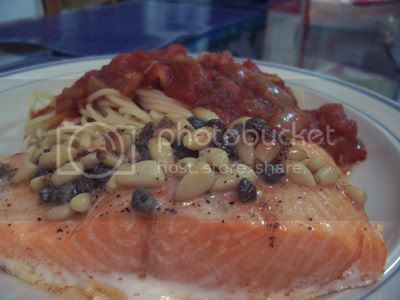 Place a side of salmon on a baking dish and top with: capers, pinenuts, butter and lemon juice. Bake in a 400 degree F oven for 20 minutes and dinner is served! There are no measurements as I just put what ‘feels’ right. I didn’t add any additional salt either as the capers are quite salty already. I used one lemon which I squeezed across the length of the salmon, and probably 4-5 tablespoons of butter scattered in pats over the salmon. We just had salmon for dinner, but this still looks yummy. I’ll have to try that out later this week. My husband would love that! Unfortunately I don’t eat fish, as I’m vegetarian. I so wish I liked cooked salmon. I love smoked salmon but not cooked salmon. I love the white fishes, cod, halibut, orange roughy etc. As for kitchens, the one I’m in now is small. Thus having to get creative.